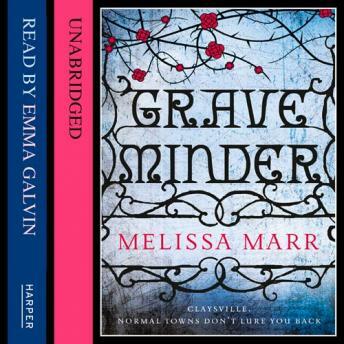 When Rebekkah returns to her small-town home for her beloved Grandmother's funeral, little does she suspect that she is about to inherit a darkly dangerous family duty on behalf of Claysville's most demanding residents - the dead. Everyone in Claysville knows that the Barrows are no ordinary family, but no one can really explain why. When respected matriarch Maylene Barrow dies suddenly her granddaughter Rebekkah returns to the small town she grew up in, where she must face the demons of her past - the suicide of her half-sister Ella, the person she was closest to in the world, and the subsequent break-up of her parents' marriage. And she also re-encounters Byron, Ella's old boyfriend, someone to whom she has always felt a deep and mysterious connection. But the demons of the past are nothing compared with what the future has in store for Rebekkah. Her grandmother has left her an inheritance both wonderful and terrible. An onerous responsibility now rests on her shoulders - one for which she is ill-prepared to say the least. For behind Claysville's community-spirited, small-town facade lies a dark secret. One that ties Rebekkah and Byron together in an inextricable bond, and that will require them both to sacrifice everything to keep their friends and neighbours from harm.